This event is part of the School Games programme and is open to all schools in the Partnership. The winning team from this event will go on to represent South Cambs SSP at the School Games Summer Festival on Thursday 27thJune 2018. This competition is an entry level event, aimed at beginners and players new to the game, rather than an opportunity for advanced players already competing regularly outside of school. If a young person is regularly competing, they already get plenty of other opportunities to play and compete. Advanced players are NOT allowed to play but we would encourage schools to involve these youngsters by giving them a role such as team captain or assistant coach. Teams are mixed -2 boys and 2 girls. Mini Tennis Red uses badminton sized courts, 23” Mini Tennis rackets, Mini Tennis sponge balls if played indoors, or Mini Tennis red felt balls if played outdoors. The format is Timed Tennis; players play for a set period of time, until the whistle blows. The length of matches depends on time available and amount of entries, but matches normally last five minutes. Download the full rules here. More information regarding format of the tournament will be sent out closer to the event but schools are encouraged to enter early as there are only a limited number of entries for this event. Fully Booked! 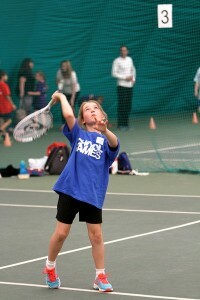 Mini Red Tennis (Comberton) - 15th May 2019 Free!